Welcome to our kitchen layout ideas guide which is all about helping you to create a functional kitchen. Building code stifles creativity and just plain doesn’t make sense. Isn’t that the truth? It’s not. Building code relays the best practices for safety and is perfectly logical. For example, stair balusters have to be placed close enough together that a four-inch-in-diameter ball can’t go through. Does that number seem random? It’s actually because four inches is considered too narrow for the average infant’s head to fit through. Not having to butter your kid’s ears to get them out of the bannister is a good thing. These types of solutions to everyday problems are used in kitchen code and design–and no other room has as many design considerations as a kitchen. 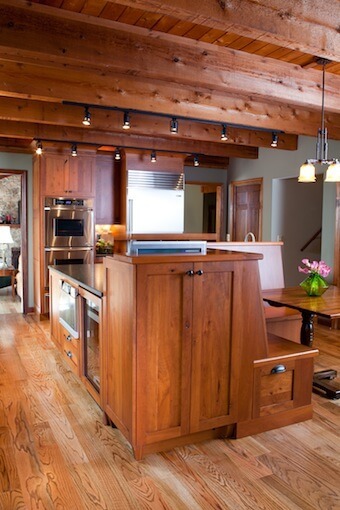 Not everyone has a cavernous kitchen. Many have the gas lines, vent hoods, supply water lines, 220 electric service, and sewer pipes jammed into spaces as small as 200 square feet. Now that can get dangerous–and is precisely the reason why so much of building code is dedicated to the kitchen. Building codes are decided by the International Code Council and then adopted by local law makers. As such, your kitchen has to meet code whether you’re building or remodeling. A legitimate, legal project has the required permit and has an inspector determine whether the completed work is up to code. Building code is absolute, but this isn’t the case for best design practices. These are simply ideas that were developed by kitchen design professionals over the years and are widely accepted to be “the best.” Occasionally, these will arise from building code, but most often they arise from simple common sense. 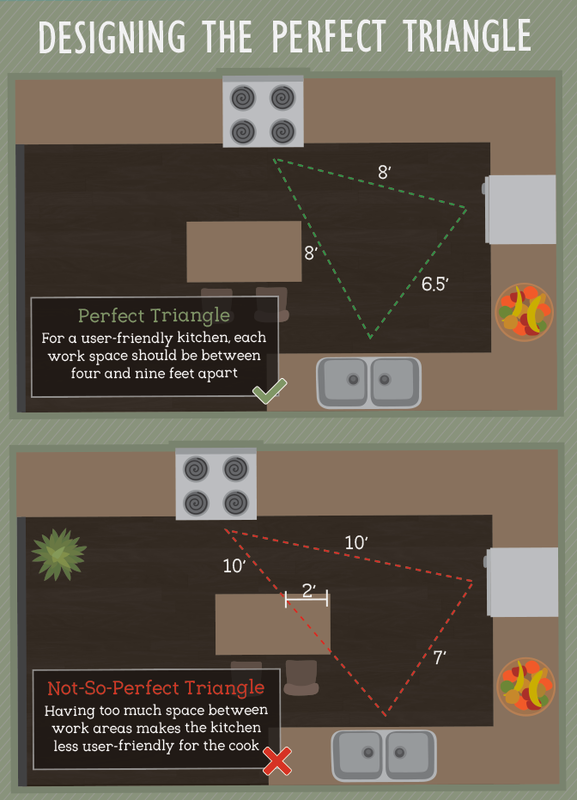 The “kitchen triangle,” discussed later in this post, is a design practice derived from efficiency. No permits were ever lost because their kitchen didn’t fit this model–it’s simply a good way to plan your kitchen. 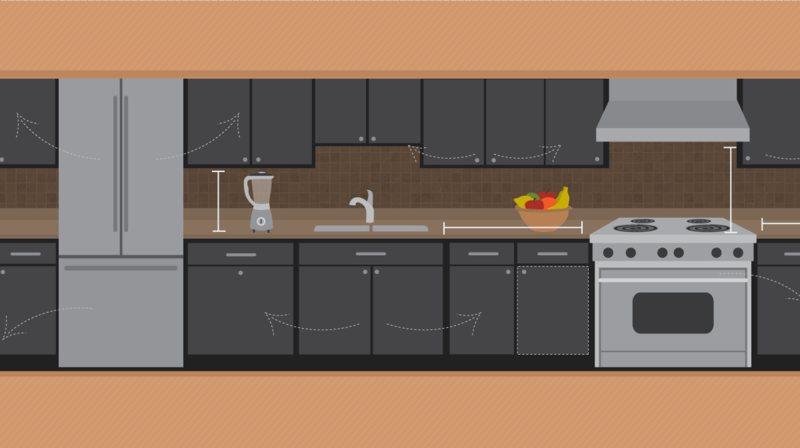 Once you read this article and learn the fundamentals for kitchen layout, check out our list of the top kitchen design software options (free and paid). The good news is that there are 8 main kitchen layouts to choose from. Actually you can lay out your kitchen in more formations than that; but there are 8 common layouts. We set them out below. The bad news is that you have to pick one which isn’t always easy. My favorite kitchen layout is a single wall with long island. We used to live in a very cool open concept house with this layout and it was great for entertaining and on a day-to-day basis. => Check out our single wall photo gallery here (with islands and without islands). 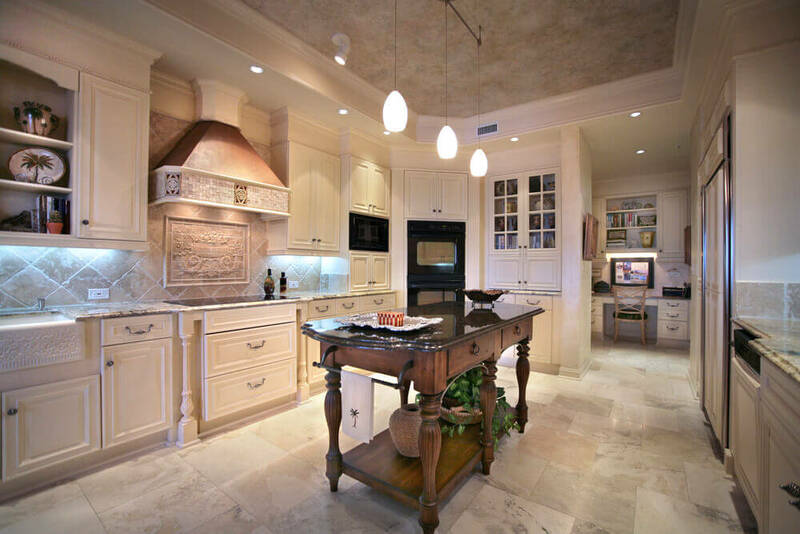 => See massive galley kitchen layouts gallery here. => See L-shaped kitchen photo gallery here. => See our extensive U-shape kitchen photo gallery. While not really a layout, more and more kitchens are incorporating 2 islands. Here’s an example of such a layout. 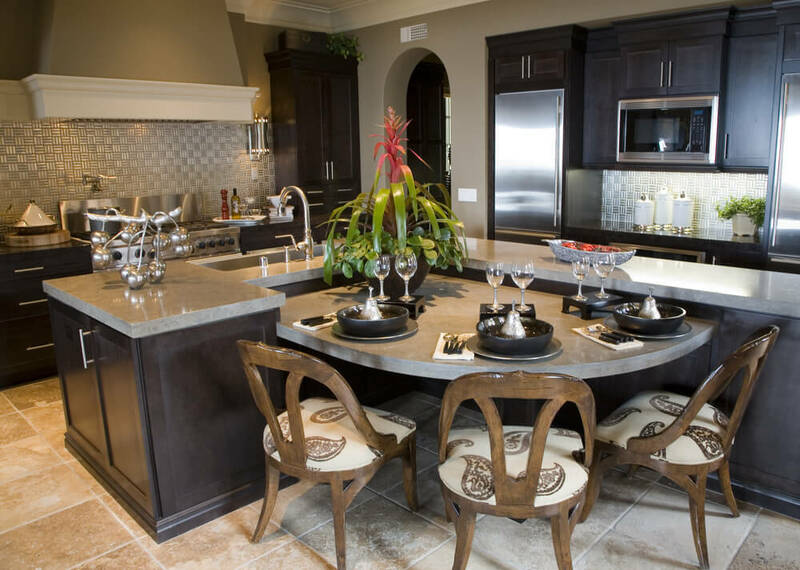 => See our gallery of kitchens with 2 islands here. Custom layout: Some kitchens buck conforming to typical layouts and come up with unique layouts. Open floor plans came into fashion nearly seventy-five years ago and are still going strong. As interior walls came down, the kitchen, dining room and even the living room became separate parts of one large room. With this change, people in the kitchen could interact with those in the dining room and living room, creating a more social atmosphere. Of course, many kitchens remain behind doors, and even if there isn’t a door, there will be an entrance. Building code states that the minimum width for entrances is 32 inches; and if doors are installed, they shouldn’t open into appliances. In the same way, opening the stove or refrigerator door shouldn’t hit your door or block the entrance. The three most important stations in the kitchen are the stove and oven, sink, and refrigerator. As seen above, this forms a triangle. An efficient kitchen doesn’t allow these three sides to be too far away. A cook moving back and forth between the stations with hot food in hand shouldn’t have to go very far, or around various corners. A cook in the kitchen above may end up with the corner of the island jammed into their hip when they’re in a hurry–and that is painful. The legs of the triangle should not exceed a sum of 26 feet. Each leg of the triangle should be between four and nine feet. Keep your triangle looking as much like an equilateral triangle as possible. Attempt to keep paths between the points of the triangle uninterrupted by large items. Small impediments are acceptable, but if it pushes you off course more than a foot, it’s too much. Any other work areas, like microwaves, or other small appliances should fit the same requirements as the triangle legs. No less than four feet away and no more than nine from the closest point. The recommended minimum linear countertop space is just over 13 feet, but understand that small galley kitchens or L-shaped kitchens may not be able to reach this number. Choose rounded or clipped edges over sharp, 90-degree angle edges. This should be pretty easy to do, as most manufacturers don’t even make 90-degree counter edges anymore. And while this certainly does prevent hip and waist level bruises, it isn’t the only reason. Square corners can cause countertop cracking. 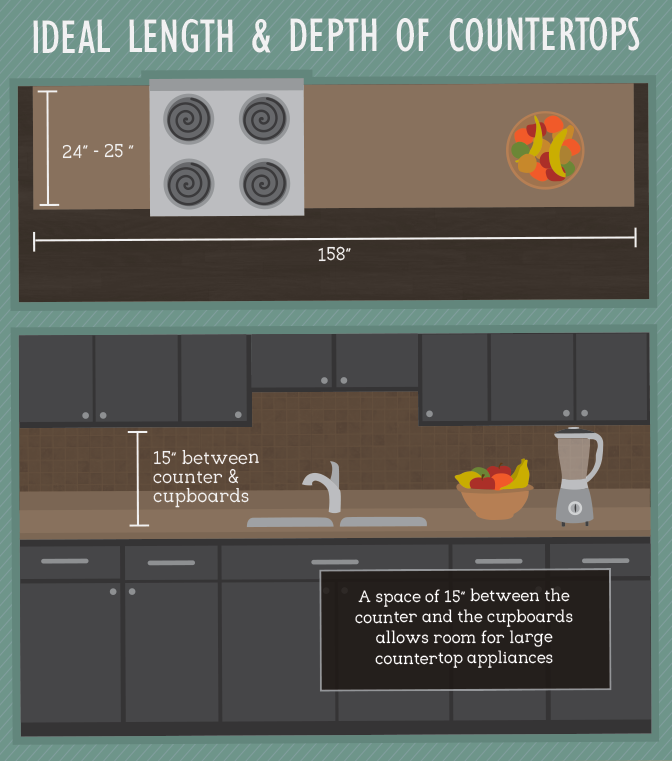 The recommended depth of a countertop should be between 24 and 25 inches. That’s the distance from the edge of the counter to the wall or backsplash. The majority of counters are manufactured to this specification, so unless you plan to have custom counters made, it’s hard to mess this up. Many kitchens have a multitude of large countertop appliances–blenders, microwaves, toaster-ovens, standing mixers–and so you should provide for more vertical space between the countertops and the undersides of your wall cabinets. The recommended minimum distance is 15 inches. Let’s talk about sinks. Sinks aren’t really mentioned in code, nor in design practices. If it’s practical, it’s allowed. You can choose from single-, double-, or triple-basin, depending on your needs. The manufacturers keep tight regulations on most sink features including drainage slope, fixture hole placement and material composition, so you don’t need to worry much about your sink. Any best design practices that mention sinks namely talk about the spaces closest to the sink. When placing a sink, put it directly next to or across from the stove and/or refrigerator. Follow the kitchen triangle, and you’ll meet this one easily. 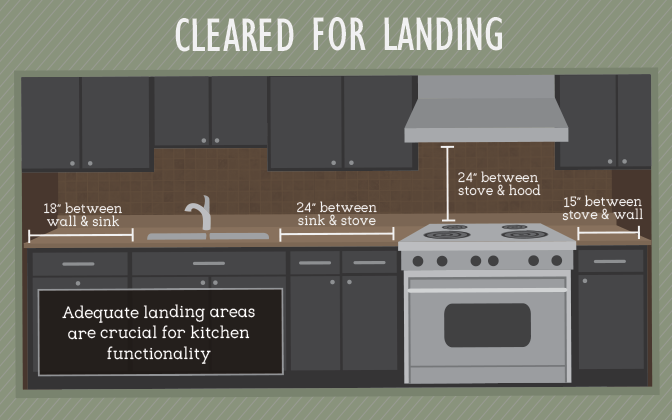 The sink should have “landing areas” on both sides, where you can rest food items or cookware. These should be a minimum of 24 inches on one side and 18 on the other. In addition to the landing areas, it’s recommended you have another uninterrupted 36 inches directly next to the sink. Bear in mind that countertop spacing is most important when planning where to place stoves and ovens. Gas, electricity, flames, heat, and even noxious fumes are involved, and your safety should be your first concern. The most pervasive problem with stoves is all the creative places cooks find to place their hot pots and pans. At the barest minimum, you should have 12 inches on one side and 15 on the other side as landing space. Now, this is hardly enough space for a small pan, let alone baking racks, so greater widths is recommended. Ovens tend to be located beneath stoves as a single appliance, but should yours be separate, an oven should have 15 inches of landing area on either side. Ovens must have a minimum of 15 inches of adjacent landing area on either side. However, because most ovens tend to be located under stoves as part of a single appliance, this landing area is usually already covered under the stove requirements. Above the stove, a total of 24 inches is required between the stovetop and the nonflammable surface above. Vent hoods may not be required, but they are highly recommended. Should there be a combustible surface above the stove, like a cabinet, another six inches is required between the underside and the stovetop, making it an even 30 inches. A total of 24 inches of vertical space is required between the stove and a noncombustible surface such as a vent hood. Vents are not required but are advised, with minimum draw of 150 cubic feet per minute draw. Building codes tend to be all-encompassing, and within those broad guidelines, you are free to be as creative as you desire. They protect your safety and health and provide the kitchen planner with the tools to create a functional and comfortable kitchen. Dimension graphics used with permission by Fix.com. Here’s a dimensions chart setting out adequate kitchen island sizes according to the different number of stools. It’s hard to choose a size until you’ve actually cooked in kitchens of various sizes. If your current kitchen is too small (see our small kitchens gallery), how much should you expand it? If you’re designing from scratch, how big should you make it? On the flip side, you can create a kitchen too big (see our spacious kitchens gallery for sizeable kitchens). At some point a kitchen is so big you spend more time running around than actually getting food prepared. How many people use the kitchen at the same time? Do two or more people jostle around or is it a one-person show? How many kitchen appliances do you have? Do you like them on counters ready to use or store them? One great way to hone your kitchen layout is to use kitchen interior design software to create floor plans with your allocated kitchen space. You probably know immediately whether you want an open concept kitchen or more of an enclosed kitchen or a hybrid. A hybrid is a kitchen with dining area included. A fully open concept living space is a larger room with kitchen, dining area and family room (or living room). Generally, open concept is preferred over closed these days. However, one consideration is if you entertain often and you prefer guests not seeing the kitchen in a chaotic state. Of course, the downside to a closed kitchen when entertaining is the cook is cut off from the pre-meal entertaining. Planning your kitchen zones can be simple if it’s a smaller kitchen or more difficult with a large kitchen. The key is to plan the layout based on tasks you perform in the kitchen. While there are universal tasks performed in all kitchens (cooking/washing/prepping/storing) there are tasks you may do that other people don’t typically do (pizza making/baking/cooking with kids, etc.). Cooking/Oven Use: Ensure you have flat, bare counter space adjacent to the stove/oven for placing hot food. Ideally, you’ll have sufficient space for plating without having to truck hot pans and pots any distance. Washing: This is simple. Place the main sink close to the dishwasher. Ensure there is ample counter space next to the sink. You also want disposal near the sink (which is a long-standing garbage/recycling placement). Prepping: If you chop and/or bake, you want counter space close to the refrigerator. Ideally the prep counter space will also be close to a sink for rinsing. One thing to include in the prep zone is a space for a computer (laptop, tablet or something similar) so you can follow recipes. Generally the prep zone is a good place for this because it’s where you prepare your ingredients. Storing: Every zone should include sufficient storage so that the tools you require are only an arm’s length away. For example, if you have a baking zone, have nearby storage for your baking appliances and implements. The refrigerator/freezer are also a storage units. Their use is enhanced with counter space adjacent to them when pulling out a lot of food or putting in a lot of food (i.e. grocery shopping day). You may have unique storage requirements such as wine, recipe books, small kitchen appliances, etc. List out your storage requirements and apply to the applicable zone(s). Guest/family zone: This is big if you like cooking with guests and/or your family around. 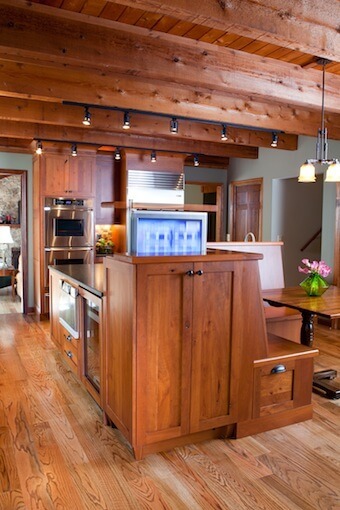 A simple solution is a counter or island bar. You might even consider a sofa off to the side. Specialty food preparation: Do you routinely prepare types of foods that have a unique process? If so, plan accordingly. Kitchen appliances: It doesn’t take too many small kitchen appliances to clutter up a kitchen. Be realistic about which ones you want on the counter (only those you use regularly) and those you can store. 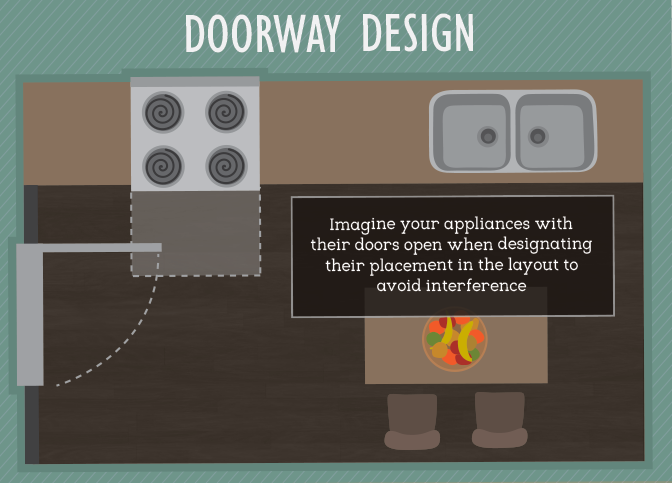 If you use an appliance regularly, plan a zone around it. For example, if you’re into juicing, creating a small juicing zone near the refrigerator with a sink nearby. Computers: It’s handy having a computer or iPad in your kitchen for online recipes. If you’re designing a kitchen, seriously consider creating a space for your computer. Generally, the prep zone is best. This refers to appliances, implements and anything else you might need for each zone. Don’t forget counter space, storage, floor space and complementary zone access. NOTE: I realize zone planning seems technical and overly detailed, but planning out your kitchen zones requires careful thought and planning. Be thorough because proper zone planning can radically enhance your kitchen for you. 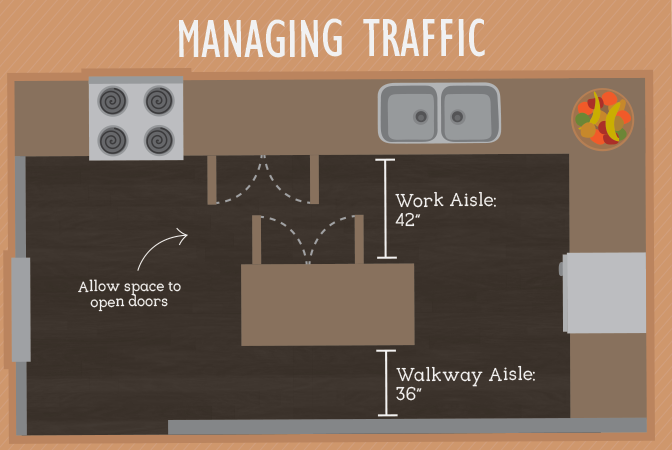 Work aisles: If you have the luxury to do so, create wide work aisles. This is a terrific convenience when two or more people are in the kitchen. The minimum width is 42″. If you have multiple cooks, go with 48″ or more. Counter space is a premium: I’ve never been in a kitchen with too much counter space. One universal requirement with pretty much every kitchen task. This is a huge benefit to large kitchen spaces. While storage is great, more counter space is often better. Your kitchen’s users’ height: Are you or anyone in your family tall? 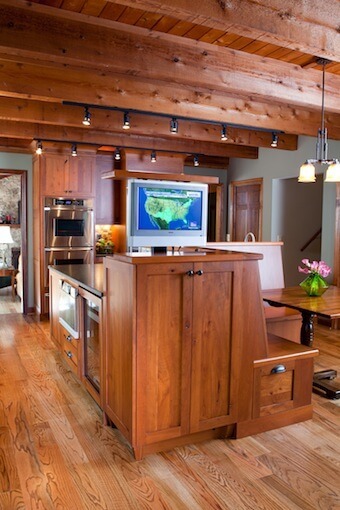 If so, pay attention to overhead cabinet placement, island height, counter height and lighting. Doors and openings: If you have swinging doors as part of access to your kitchen (becoming rare these days), take into account the arc of the door if it swings into your kitchen. Below is a detailed text and illustration-based guide on what to do and what not to do when planning your kitchen layout, based on Lee Wallender’s article (used with permission).